Lying face up on bench, feet on floor, a dumbbell in each hand and held above the chest with palms facing each other, arms straight but slightly bent, lower weight to sides by rotating shoulders, stretching the pecs, then bring weight back to starting position. The elbows should be just slightly bent – bending takes pressure off the elbows but bending too much simply lessens the resistance on the target muscles. The palms are facing together at the top of the exercise and then towards the ceiling at the bottom. Lower the dumbbells down far enough to fully stretch the pec muscles but don’t force it (don’t strain to get lower). Raise the weights, both arms simultaneously, as though you are attempting to hug a large object – imagine a bear, a big woman or whatever may be your thing. It isn’t necessary or desirable to clank the dumbbells together at the top – you just want to go to where the dumbbells are directly over your shoulders. This exercise can prove to be tough on the shoulders (rotator cuff). Be careful not to go to heavy and cause injury – this isn’t an exercise where you will be able to lift the great amounts that you may get up on pressing exercises. Slowly moving up in weight is the best idea. This was one of Arnold Schwarzenegger’s favorite exercises and is generally regarded as a good chest shaper. 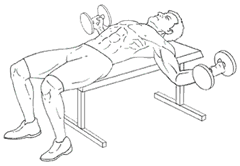 Decline Dumbbell Flyes – Save movement done on a decline bench. Machine-Based Flyes – Cable machines allow you to do a variation of the dumbbell flyes and, though hard to find, there is a lying lever fly machine. Pec Deck Flyes are the closest substitute beyond the machine alternatives listed above. For targeting the pecs, in addition to compound exercises like the Bench Press and Push-Ups, another solid isolated exercise using dumbbells is the Dumbbell Pullover.